Every month I pour R350 down the drain; and I’m sure you do to. That’s how much I spend on heating water for showers, washing dishes. Geysers and Hot water are a great place to focus any energy-saving measures as for most homes it’s the single biggest spender. This post helps you work out how much your spending; that’s always the first step to making intelligent energy savings. It’s not just us at Homebug that say Geysers are the key to your energy savings, the City of Cape Town’s “Smart Living” handbook can’t get enough of them either. But how can you tell if it’s really your geyser that’s causing your big bill or not? This little how-to is a bit longer than most, so please bear with us. At the very least at the end of this you’ll be able to tell all those solar-water-heater sales men that they haven’t got a clue; and at the most you’ll probably find a way to save loads of money! How much hot water do I actually use? The first step is figuring out how much hot water you use. Most of your hot water is probably used when showering or bathing in the morning – so maybe have a look at our article on that here. So basically I use 5.25 electricity credits every day heating up water. But your geyser uses more energy than that, it has to keep the water hot for when you need it. That’s what we work out next! How much energy does my geyser use without me! Geysers, just like kettles, lose heat through their walls. When they are turned off the water inside will slowly cool down to the same temperature as outside the geyser. When a geyser is turned on it automatically switches itself on and off to keep that temperature the same – like a kettle being switched back on once the water gets too cold. Fortunately your geyser has a lot of insulation so that is doesn’t lose heat too quickly and even more luckily for us working out this calculation, modern geyser’s are even required to test how much they lose. If you have one of these modern geysers it may have an energy category on the side with a letter from A to G like the picture on the right. If you’re geyser is rated A it is very efficient and very green, all the way down to G which is very inefficient. These categories depend on a test and little formula from SABS/SARS. Don’t we’re not going to dive into that… instead I’ve put the results of that calculation in a table below. I have a 200L tank that is category E – so my geyser uses 3.0kWh per day, just keeping itself warm – regardless of whether I use ANY hot water. If you don’t have an energy rating on your geyser, it’s probably pretty low down. Very old ones and ones stored outside will be much worse even than these figures – but to be on the safe side, just assume they are category G — e.g. so if I have an old 200L geyser, it probably uses a little more 4.1kwh/per day staying hot. Luckily I’ve got a more efficient one than that and only use 3.0 units/day! So finally I take 246kwh/month and multiply by 1.425 to get R350.55. I spend R350.55 each month on hot water – then I throw it down the drain! How about you? Please comment if you’ve got stuck or if you’ve got any questions. We’d love to hear from you. I am lost for words – i buy R100 electricity and only gets approx 44 units which basically disappears over night ? How much is a unit / rand ? I work out that the cost to heat my electric geyser for a month is around R815 (at R1.66 per kW) if i use it full time considering my family of four (2+2 teenagers). The same cost per month for a gas geyser is approx R400 per month, based on the current price of R21/kg. A 6 min shower uses less than 200 grams which equates to at least 100 showers per month from a 19kg cylinder (cost approx R400). In my opinion a gas geyser delivers hot water quicker to the shower because it is optimally located outside the bathroom so the cold water in the pipes is reduced. Water consumption is also optimised. I would be interested to hear whether my calculations are accurate. I would really like your input about this. I think about to remove my geyser and install 2 (7Kw) or maybe 3 of them. Yes, I understand the front-up costs will be high, but for the future (this is a flat and not a house)? Creative, but not so efficient. Instantaneous water heaters (decentralised – tankless) are definitely the future with A grade energy ratings they only use electricity when the tap is open. Energy and cost savings are astronomical compared to geysers. Plus multiple use and exact temperature specifications. Little room for questioning. What about these new tankless water heater how much do they consume from a shower perspective ? A tankless heater will only save you money on the ‘standing loss’ part. (assuming you don’t have any leaks and you shower at the same temperature as before!) — and assuming you GET rid of your geyser at the same time. 1. Water starts off cold, then is BURNING hot, then is the right temperature… which means every time you ran a shower/tap you had to leave it running for a couple of minutes before being confident it wasn’t going to scold you.. this means you do end up using more hot water? 2. They really need the electricity infrastructure to back it up – every time you turn the tap, the lights dim… so I bet the whole block of flats needed to have that huge load planned in – otherwise the power would have been tripping for the whole block! It’s no good just adding one of these units to your shower — if you keep a geyser and you keep that geyser warm, you’ll not save ANY energy at all… (well, okay, you will save the heat lost in the pipe work from your geyser TO the shower… but for a shower that would be a small amount). I’d be happy to look into it. We’ve done lots of calculations on heat-pumps for big users (like factories and hotels), but not really looked at the residential market. Just to make it more relevant – do you have a specific heat-pump in mind? Also, if you know how much you’re being quoted for buying/installing etc… that would be really good! So simply put, if it’s installed and maintained correctly, a heatpump should reduce the amount you spend on heating water by 2/3! It would be handy to have an excel with this equation. Hi Neil – it’s basic and messy, but here you go! Post back if you want some guidance on it – or if you have any questions. I want to know which uses more electricity and by how much the geyser vs lights.. My husband and I have this argument all the time, he finishes all the hot water almost every time he showers yet he screams at me for leaving a light switched on or a charger still in the plug. Please reply to me via my email. The geyser uses say 3KW to stay warm, so you should not use 5.watever KW to heat it up. The water temp should not need those KW as the water will not fall to say 15 degrees. Thus, the point is that to keep the water Geyser on instead of switching it on and off, should not have the impact you calculate. To get off the grid is the point, but by saving, no way’s. Would love to reply in more detail here, but I’m not sure what point you’re making. So, by these calculations you could have put in a more efficient geyser after one year’s of usage and save about 40% on heating up your water. Or upto 60% saving if you fit a gas geyser. Unfortunately that’s not true at all. A “more efficient” geyser cannot reduce the amount of energy in the hot-water itself***. A more efficient geyser would only reduce the ‘standing losses’ part. 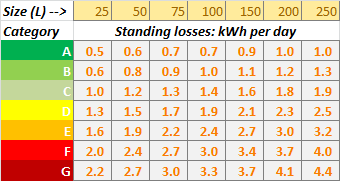 The most efficient 100L Geyser (class A) uses 0.7kWh/day staying warm, whereas the least efficient (at least in the table — you own installation can be MUCH worse, say if it’s outside, not insulated at all, very old, etc.) uses 3.3kWh/day. So that’s a 2.6kWh/day difference – times 365 days per year = 950kWh/year = R1,500 per year. I’m not sure about you, but I’m not sure I can get a brand new, very efficient geyser installed for that much?